The food and beverage industry have evolved significantly over the past 10 years. The rules for the FDA’s Food Safety Modernization Act (FSMA) have changed food and beverage manufacturing by having companies focus on preventing their products from being contaminated rather than limiting the scope of contaminations. The law now requires that companies in the food and beverage industry to exert tighter control of operations as well as provide documentation and tracking of every ingredient used throughout the enterprise. At the same time, organizations are under increasing pressure to keep customers happy and save money but not skimp on quality. Poor quality can have wide-reaching effects on food and beverage companies because just one recall can bring a business to its knees. “To be successful, food and beverage manufacturers must stress closed-loop quality, traceability across the value chain, and compliance throughout the process,” according to the recent “Impact of FSMA: Taking Stock of the F&B Landscape in 2016” report from Aberdeen Group. Because of the increased attention on the industry, food and beverage companies cannot risk even one shipment that is not of the highest quality, the report notes. That means food and beverage companies will most likely have to make changes to their operations to ensure compliance with the law. To do that, organizations must have compliance and traceability built in from the start. Constructing a program that works and complies with FSMA takes “the right technology tools, proper document management and real-time visibility across the enterprise,” according to the report. Reyes says for food and beverage manufacturers to achieve the goals of FSMA, they must focus on hazard analysis, preventive controls, and good manufacturing practices. There are a number of tools and services to help companies comply with the FDA’s regulations, including food safety consulting companies that can help manufacturers transform sanitation programs and meet FSMA compliance, Reyes says. “Besides consulting, investing in the right tools and technologies can really improve sanitation results, product quality, and food safety and help you prevent cross-contamination and get you up to the FSMA compliance level,” he notes. Additionally, Reyes says suppliers should also help their food and beverage manufacturing customers meet FSMA compliance. Goodway can help by making certain you have the right sanitation equipment in place. With the FDA tightening food label regulations and the risk of added allergens prompting regular product recalls, it’s worth taking a look at the future of food — what’s currently in development, what’s just around the corner and what can companies expect to see down the line? Last year Australian authorities were forced to recall a particular brand of bagged and frozen berries — which originated in Chile and China — after a Hepatitis A infection of four adults was linked to the product. According to ABC, the country is now rolling out new legislation which requires companies to mark the “country of origin” on virtually all food products. Products made in Australia will carry a “kangaroo” logo and also specify which ingredients were sourced locally, which were purchased elsewhere and which items were simply “assembled” in the country. It’s a big step for consumers and producers, who are now on the hook to design and implement entirely new labels within two years. Stateside, the country is rolling out legislation which requires all foods containing genetically-modified organisms (GMOs) to be labelled as such. As noted by PBS, Congress recently approved the new bill; the Agriculture Department has two years to write specific rules detailing exactly what these labels need to contain. At minimum President Barack Obama says that most packages will need to carry a label with text, symbols or electronic codes which indicate the presence of GMOs. While the scientific community and the FDA agree that products which contain genetically modified organisms are safe to eat, consumers want “more information” about the origin and composition of specific ingredients. With consumers and government agencies now demanding that food retailers and manufacturers both track and detail the country of origin and specific ingredient composition of their products, it’s not hard to imagine next steps. In the same way consumers worry about contamination from potential allergens or GMOs, for example, they could just as easily have concerns about specific food manufacturing techniques — leading to legislation which compels producers to provide details about the machinery which processes and packages certain food. Hand-in-hand with type of potential oversight comes increased scrutiny of cleaning techniques and scheduling; violations could see companies fined or out of business until issues are addressed. Getting ahead of the game here starts with record-keeping — by keeping accurate and detailed reports about when specific machines were cleaned, how this task was carried out and if any issues were detected, processors can help future-proof their production lines. 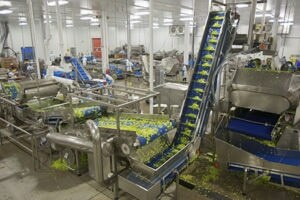 According to Evan Reyes, Goodway Technologies product specialist for the food industry, “complete, accurate, thoroughly documented SSOPs and Master Sanitation Schedules are essential for the modern food processor,” especially since under new FSMA legislation effective documentation is mandated by law and SSOPs can be requested by the FDA during any inspection. Despite the use of SSOPs, proper ingredient labelling and the use of color-coded production tools, cross-contamination of GMOs or non-origin-country ingredients may still occur. 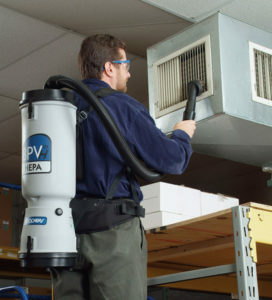 Here, your best bets are highly adaptable and thorough cleaning systems, such as HEPA filtered vacuums which capture food particles down to the micron level, helping to quickly eliminate any extraneous ingredients which have made their way into your food-prep or processing environment. Emerging food legislation is focused on the combination of origin specificity and easy consumer access to ingredient information. Moving forward, companies should expect a greater focus on process mechanics and record-keeping — the right prep now can help buffer businesses against demands of new food product policies. 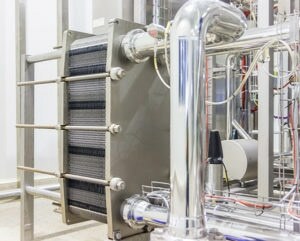 Heat exchangers are used in a variety of appliances in our daily lives, including air conditioners, chillers, furnaces, boilers and condensers. They are also widely used in manufacturing environments and processing where shell and tube and plate and frame heat exchangers work to cool air compressors, oil pumps, extruders, food processing equipment and so much more. 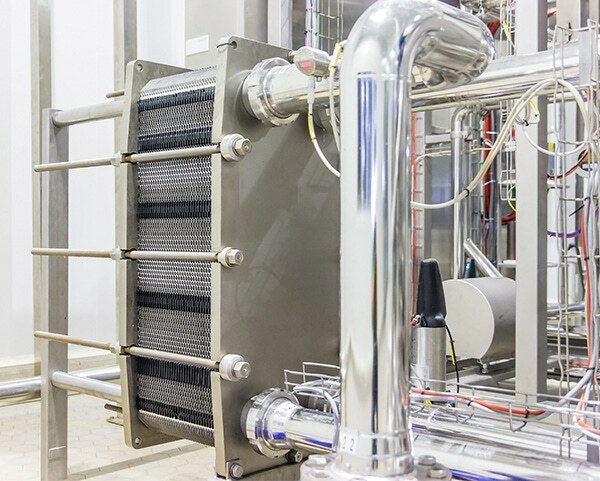 In the most basic terms, a heat exchanger is a piece of equipment, comprised usually of ether tubes or plate, that efficiently transfers heat from one medium to the other either heating or cooling. The problem is that material deposits WILL accumulate on heat exchangers and reduce heat transfer, something that’s known as fouling. These deposits can be biological in nature or most likely solid mineral deposits if water is used as a primary heat exchange medium. Your facility’s boiler may finally be at rest now that the heating season is over, but that doesn’t mean that you should overlook your boiler’s maintenance needs. The perfect time to address any maintenance issues is when your boiler is offline. Proper maintenance is key to keeping your boiler functioning reliably. But as we explain in our past post, What You Need to Know About Boiler Maintenance Costs and Benefits, a preventative maintenance program also improves safety, minimizes downtime, decreases replacement costs and reduces energy and water usage. 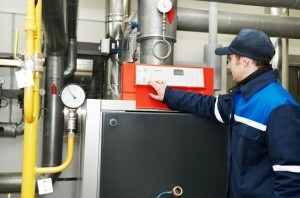 A boiler inspection should occur regularly, at a minimum of once a year. Energy Manager Today recommends checking the boiler for leaks and proper functioning of valves, controls, safety devices, and indicators as part of a standard boiler maintenance program. Any parts that are not functioning properly can put the boiler at risk of major damage. Additionally, during the inspection look for any signs of corrosion or overheating. These are potential warning signs that the boiler is not working properly and you should repair it promptly. In the introduction to our checklist, How to Clean Industrial Boilers, we explain that fuel consumption within a boiler can increase by up to 5% because of scale, according to a report by the U.S. Department of Energy. Dirty boiler tubes affect efficiency in both old and new systems. Facility managers must include boiler tube cleaning as part of their preventative maintenance plans. Preventing scale build up in a boiler can reduce energy costs as well as reduce the cost of repairs and lengthen the system’s lifespan. Goodways offers a variety of brushes and scraper tools that attach to our cleaning tools to remove light deposits as well as thick deposits and everything in between. Our liquid descaler product breaks up the toughest deposits. Our descaler equipment with pH analysis automatically descales while it monitors pH. The equipment injects chemicals as needed until the boiler is completely clean. With Goodway’s boiler tube cleaning tools, it’s possible to descale a boiler in as little as an hour. Goodway is a global leader in boiler cleaning products, using the latest technologies and innovations to bring you the cleaning tools that enable you to clean your boiler as quickly as possible. Download our How To Clean Industrial Boilers checklist which explains the step-by-step tube cleaning process in more detail.